Alternators produce the current needed to meet vehicle electrical demands while the engine is running. They also replenish the energy that the battery used to start the vehicle. 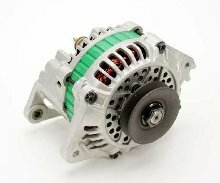 An alternator has the ability to produce more current at lower speeds than the DC generators that were once used by most vehicles. An alternator consists of an internal rotor mounted supported by bearings at the front and rear. The rear section of the alternator is called the slip frame. It is where the rear bearing is mounted as well as the brushes and diodes needed. The front half of the alternator is called the drive end. The drive end contains the front bearing which supports the front shaft of the rotor. The center section of the alternator contains the stator. The stator consist of three separate coiled wire sections assembled in the shape of a ring. The rotor used in the alternator has two slip rings at the rear of the rotor that contact the alternator brushes. The rotor contains wire wrapped in coils around a soft metal core, usually cast iron. The wire coils in the rotor are called the field coils. When power is applied through the rotor it becomes a magnet. When the drive belt rotates the magnetized rotor inside the stator, an electrical current is produced. The current that is produced is alternating current due to the rise and collapse of the magnetic field as the rotor is spun. The diodes are used to convert the alternating current into a direct current. Because of the design of the alternator it is able to produce electricity more efficiently than a generator at low RPM. Battery life is extended due to less frequent discharge at low speeds. Alternators can fail in many different ways. Rotors can develop an internal short or open causing no output since the rotor loses its ability to produce a magnetic field. Stator windings can short or become open, reducing the amount of current produced from the alternator. Diodes can short or become open, causing low current output. Alternator diodes can be damaged by improper testing. Removing the battery cable from the battery while the engine is running can cause catastrophic failure of the alternator diodes. The vehicles battery helps to control the voltage output of the alternator. When the battery cable is removed when the engine is running with a working alternator, the voltage produced by the alternator can reach above eighty volts. The high current flow can cause damage the diodes as well as other electrical components of the vehicle. Voltage regulators used are almost all solid state. Most are mounted inside the alternator. 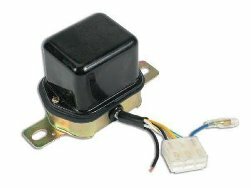 This reduces the amount of wiring on a vehicle and eliminates the need to create space to mount the voltage regulator under the hood. Voltage regulators help to maintain current output of the alternator at a specified level. The operating voltage of a running engine is usually around 14 volts. The voltage regulator works by regulating the current flow through the field coil of the alternators rotor. Current values are preset into the voltage regulator. When the charging system reaches the specified level, the voltage regulator limits current flow through the field coil. When system demand is high and voltage level drops, the voltage regulator supplies more current through the field coil, resulting in higher current flow from the alternator. 3 Comments on "Alternator Voltage Regulator"
I’m looking for some free advice. Working on a 1974 Pantera. Being an electronic design engineer by trade, I can usually fix this kind of problem, for friends too but this one is getting me. My Pantera is not charging suddenly. Changed the regulator (twice) the alternator and battery (AGM). After some troubleshooting this is what I have found. The A connector has continuous 12 volts. The S connectors has 6.2 volts (running). The F has about 2 volts (running). So the problem is low field voltage. I have a variable regulated and metered power supply. I connect to the field, while increasing the voltage my amp meter moves to the charge side starting at about 5.5v @ 2 amps then max at 7 volts with 3.2 amps. This test shows the alternator & amp meter are working. Also the “charge” indicator in the tack lights when the key is on and goes out when running. This shows me the I & A connections are correct and the stator voltage is present which engages the stator relay in the regulator allowing 12Vdc to flow from the A terminal to the I extinguishing the light. The regulator ground is in place due to the high current used by the start relay sharing this ground. An unusual symptom is when I rev the engine and turn off the ignition the amp meter moves to about +30 amps then reduces with engine RPM back to 0. This is baffling me. Any suggestions? Please let me know. 707 654 1249 W if you would like to call and talk.